Spencer Tracy and Mickey Rooney in Boys Town (1938). In movie history, the priest has been among the most common and enduring characters, and to a large extent has been played by actors of Catholic background. From the 1930s Catholics were prominent in Hollywood – whether actors like Spencer Tracy and James Cagney or directors like John Ford and Leo McCarey. Producers tended to turn to Catholic actors to perform what was judged to be the difficult and delicate role of a priest. Thus Bing Crosby played in Going My Way (1944) and The Bells of St Mary’s (1945), Gregory Peck in The Keys to the Kingdom (1944), and Pat O’Brien in Angels With Dirty Faces (1938). The individual characters may have varied, but the image of the priest remained constant. The character portrayed was one of conviction and steadfastness, of compassion and courage, and of maturity of judgment. More recent decades have given rise to different images. In the 1970s, movies began to appear that cast priests in an unfavourable light – for example, Saturday Night Fever (1977) and the Exorcist movies of 1973 and 1977. Priests were depicted as insipid, immature and, at times, embittered men. In Saturday Night Fever, the young priest leaves his vocation; in the last scene of the movie, his brother (played by John Travolta) tries on the clerical collar, only to hold it tightly round his neck in the form of a noose. This demeaning image of the priesthood in Hollywood has been due to a convergence of factors, including anti-Catholic prejudice, which intensified as a result of the Church’s stand on “life” issues such as abortion; the clerical abuse scandals, which have damaged the Church’s moral credibility in wider society, notably – and perversely – in the very areas of sexual morality that were already under cultural attack; and, finally, a general decline of heroic and admirable characters (of which the priest was formerly one), especially affecting male figures in the family and society. More recently there has been some recovery of the image of the priest – in movies like Gran Torino (2008), where a loving priest reaches out to a troubled war veteran (Clint Eastwood), and For Greater Glory (2012), which features a kindly martyr priest (Peter O’Toole). Such presentations, even when idealised, speak to a cultural – as well as religious – exaltation of the priest as a vital leader of the community. 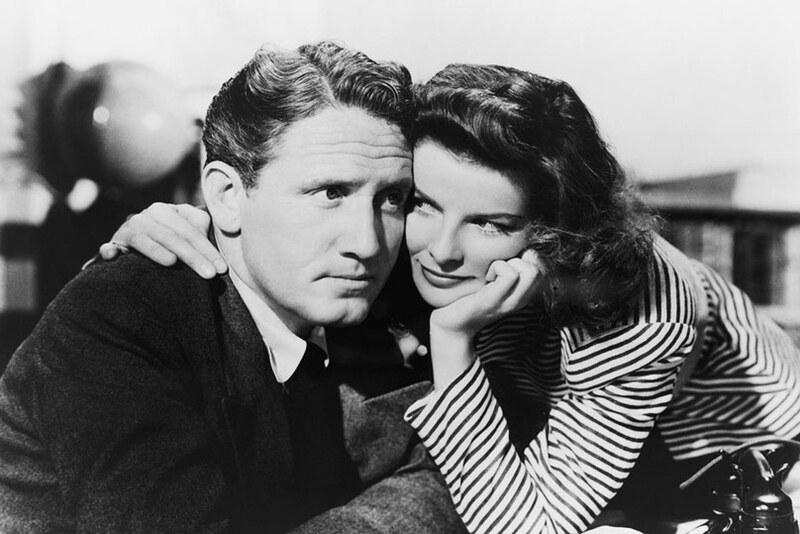 Stars of their generation: Spencer Tracy and Katherine Hepburn. This was especially true of portrayals in the years before and after World War II. 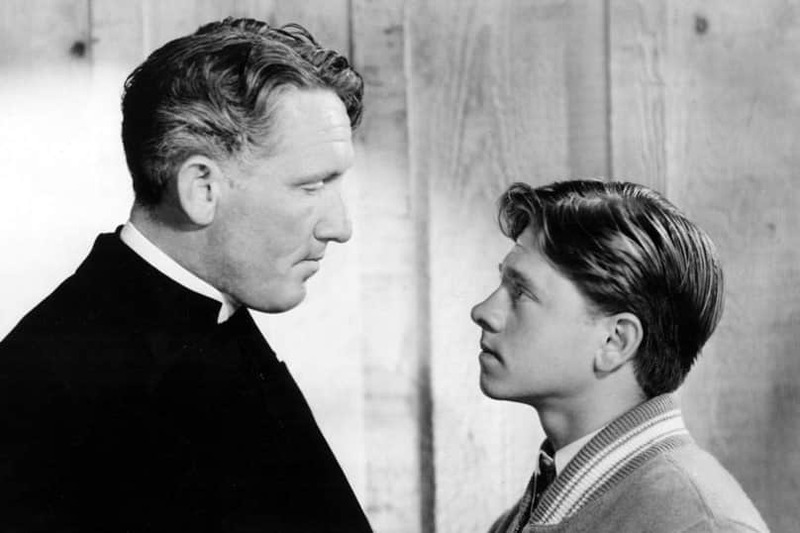 Probably no actor personified the priest in this period more vividly than Spencer Tracy. He came from a strongly Irish-Catholic background – his middle name was Bonaventure, after an aunt who was a Dominican nun – and at an early age he was inspired by the Church’s liturgy and its sacred intimations of a stage, with the priest’s gestures and silent movements and colourful vestments all contributing to the dramatic intensity of the ceremony. Tracy enacted a priest in various pictures. In San Francisco (1936), he played the kind and rugged boyhood friend of a nightclub owner (Clark Gable); in Boys Town (1938), and its sequel Men of Boys’ Town (1941), he portrayed Father Flanagan, the founder of the famous school and community for homeless boys; and in The Devil at 4 O’Clock (1961), he was an ageing, alcoholic priest who sacrifices his life to save the inhabitants of an earthquake-stricken island in the Pacific. His co-star in San Francisco, Clark Gable, remarked that Tracy hit the perfect balance in the movie between being human and holy. Afterwards Tracy received letters from atheists describing the spiritual awakenings they experienced in watching him as a priest. Following this performance, he approached with trepidation the role of Father Flanagan. He modelled his portrayal on the actual person of the founder of Boys Town, and the actor and the priest became close friends during filming. As a boy Tracy nursed the ambition of becoming a priest, and there is evidence, presented in his most recent biography (in 2011) by James Curtis, that he felt deeply he should have been a priest, not an actor, and that he had spurned his true vocation. In this he reflected an experience not uncommon in the entertainment world, in which various people have thought, at one time or another, of entering the priesthood. Modern-day examples include Jim Caviezel, who starred in The Passion of the Christ (2004), and Martin Scorsese, the Italian-American director who recently brought to the screen the Japanese Catholic novel, Silence. Even where Catholic actors have not felt called to become a priest, they can still harbour a deep affinity with the priesthood. Wahlberg’s heartfelt appeal highlights the importance of priests for ordinary Catholics – just as Tracy’s performances on the screen did for society at large. The evidence is considerable that Tracy himself was a deeply religious man – not simply in terms of devoutness (though he maintained such practices as Mass attendance and the Rosary), but also in the sense of an indestructible conviction about God. Certainly he suffered his share of temptations: the morally turbulent climate of Hollywood and a proneness to alcoholic melancholy. Though he grew estranged at an early date from his wife and had a long relationship with Katherine Hepburn, it was widely believed that he shrank from seeking a divorce out of respect for his religious faith. “I find it significant that he, a devout Catholic, and I, a confirmed atheist, could have formed and continued and reveled in a 30-year friendship. Long walks – Spencer patiently, painstakingly interpreting his faith. Long talks – during which he listened (as only he could listen) to the other side, with never a moment of pique or irritation. We reached no conclusions, changed no stands, but were both enriched by the exchange of nerve ends. Next articleMarilyn Rodrigues: What is ‘carrying my daily cross’ really about?